The great thing about getting lost on the way here three weeks ago and having to turn back: returning when fall colors are going full-blast. 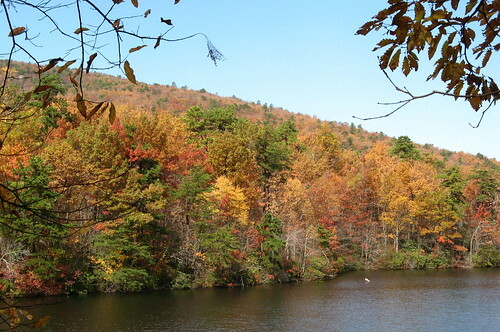 This is where your intrepid hiking blogger is forced to admit that he hasn’t done a fall-colors hike in a locale with actual fall colors since his college days at Giant City State Park in far southern Illinois, and he was very drunk at the time. The contrast in just three weeks is mind-boggling at first blush. Way back on the third of October we had a few trees doing a bit of orange and yellow, but green still ruled. 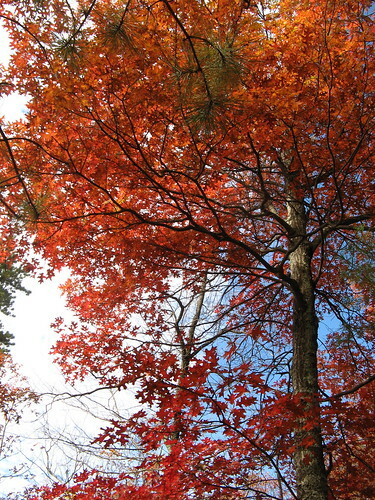 By the 25th, the green was nearly gone, oranges, reds and yellows had taken over and leaves had fallen in enough volume to make the trail invisible for extended stretches. About the hike: Moore’s Knob is the highest point in the park, with an old fire tower platform serving as an observation deck for, well, pretty much this whole section of North Carolina. The 360-degree panorama from the platform is the best in the region, by far. 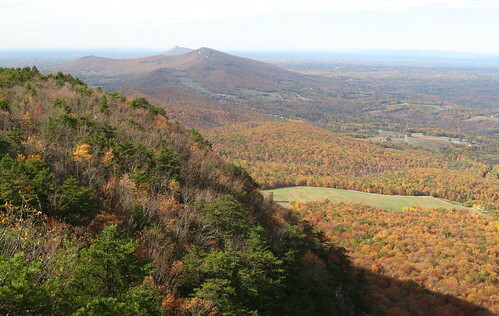 The standard 4.9-mile route to the Knob starts from the Hanging Rock Lake, takes a steep climb to the summit and a more relaxed downhill return leg. It’s a fine route (the climb is wicked, but the trail is built well with lots of stone steps) but it does draw a crowd, especially when the leaves are peaking. So I started out from the Tory’s Den Trailhead, which adds four quiet, reasonably mild miles to the hike. If you’re up for nine miles with 1,200 feet of vertical gain, this is the way to go. There’s 600 feet of climb in the first two miles and 600 more in the final 1.2 to the Moore’s Knob Summit. My GPS tallied over 2,000 feet of uphill hiking, but that seems like an exaggeration. There’s only one wrinkle on this hike: The left turn at mile 0.7. You’ll see the back side of a brown trail sign but you’ll have to walk past it and do an about-face to read the other side. This is the turn I missed three weeks ago, sending me three miles off course. 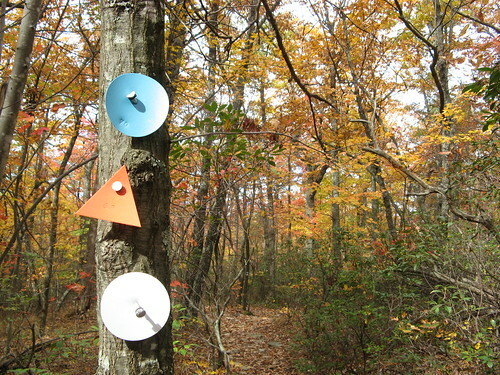 The trail to Moore’s Knob Loop has white, blue and orange blazes; if you’re seeing only orange, you’ve missed the turn. After a couple miles you hit a trail trail junction and a sign saying it’s 1.2 miles to Moore’s Knob. Hang a left there are start climbing. After the climb starts to level off you’ll start seeing little spur trails to rocky overlooks. The views are great; just watch your step. Falling off one of those rocks would do bad things to your posture (assuming you survive the slip and land where people can find you). 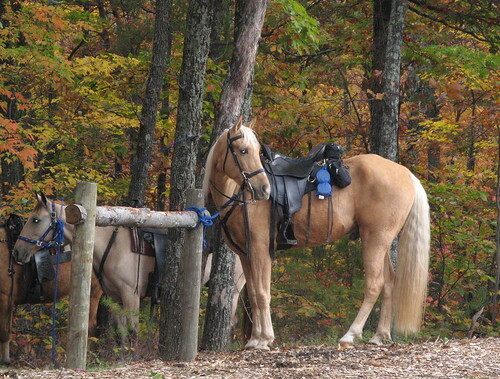 Pretty horses at the trailhead: this is a major route for equestrians, though I saw just one horse on the trail as I was hiking. (Many take the Sauratown Trail over toward Pilot Mountain). 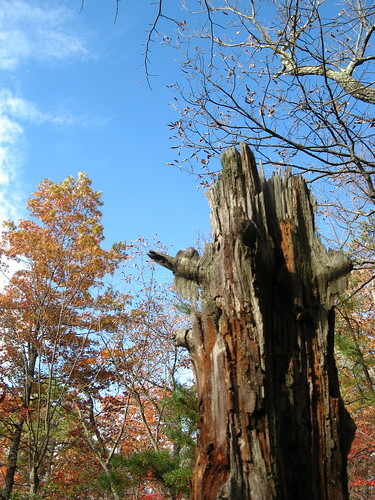 You know me and my tree stump fixation. Bright stuff on the trail near Moore’s Knob. 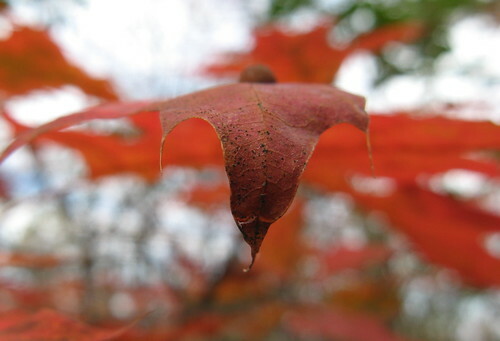 I found this leaf interesting. Pretty blue sky for a change. Lots of interesting rocks start showing up. The view from up top. 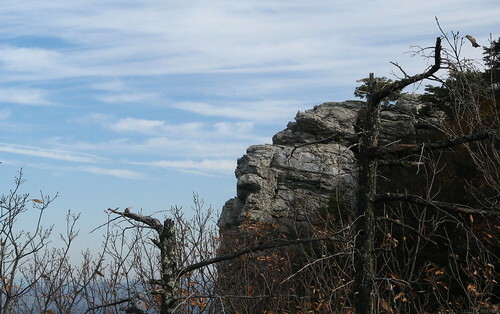 Pilot Mountain’s Big Pinnacle is visible far in the distance. I’ll let you know when I get sick of these kinds of pictures. Hill by the lake was quite colorful. 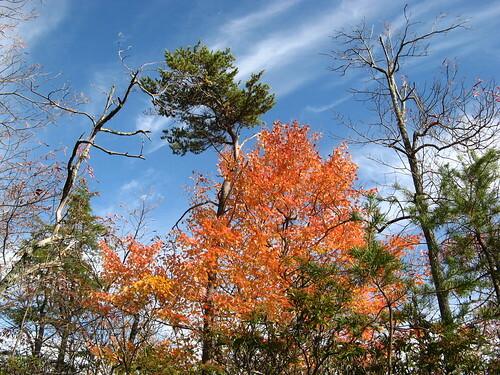 Triple blazes: White is Mountains to the Sea Trail; orange is Sauratown Loop Trial; Blue is Tory’s Den Trail. 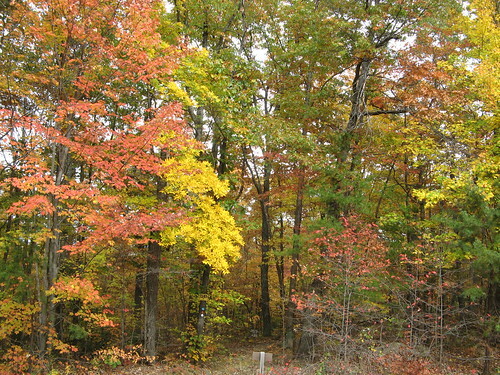 One of the most colorful scenes is about a quarter mile from the trail head. So that’s it for this week. Have to say this is my favorite Hanging Rock hike; all it’s missing is a waterfall or two. All my Hanging Rock hikes. Google map of the trailhead. This is the first time I have had the privilege of reading your blog, thanks for sharing your hike and the many great photos you took. 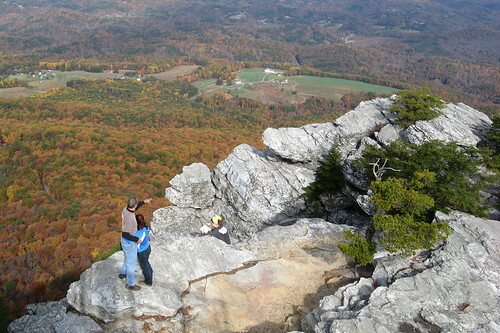 I have not been to Moore’s Knob or Hanging Rock SP, but I have hiked to many similar places. It has always been interesting to me that we seem to seek these high elevations and overlooks in an effort to lift ourselves up, both literally, and metaphorically, to be on top, if you will. Yet in so doing, we should be also humbled by the immensity of the landscape laid out before our eyes, we are only a small part of the whole. While we are all special, we are also part of a much larger dynamic, we should strive to work together to make our planet a better place to stand on top. To look out, and know that you have contributed to the whole. 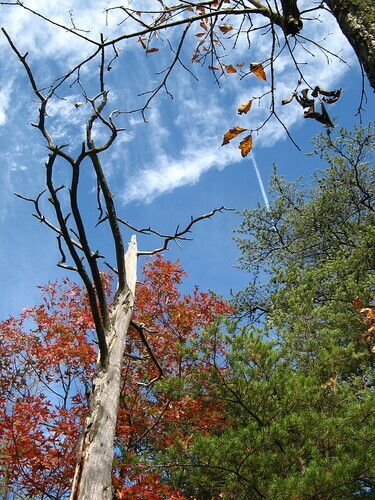 Makes me pine for my old Indiana hikes in the fall! Tom, you are definitely having altogether too much fun back there! Don’t you feel guilty about it or anything? But I am glad to see you found a good old snag to photograph. Your hiking would not be complete without at least one of those. And your pictures are as usual, killer. 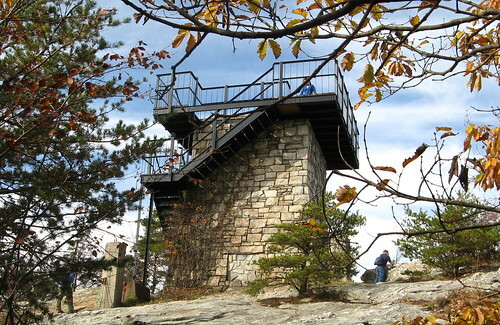 Especially when you throw in those grand views from on high or show those luscious fall colors. Wow! Great stuff! Ralph: Must be invitation only; they never sent me one. Obviously a lesser summit then. On a different topic, there is a blog that is stealing entire blog entry content. One of mine popped up in a google alert, and then I noticed they were also stealing yours Hiking Trails Blogs. What I can’t figure out is what their angle is. A similar one used to substitute spam links for all the original links, but this one isn’t doing that yet. They are stealing my content and traffic and I don’t like it. This is the first time I’ve stopped in here. 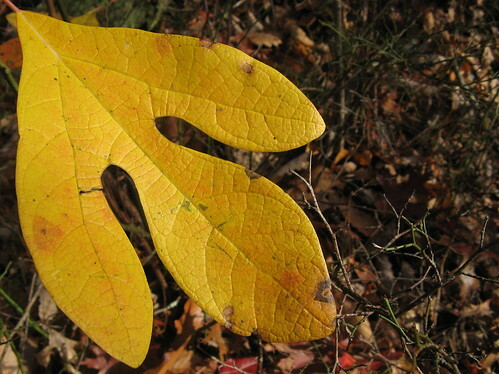 I’m thoroughly enjoying the hiking information and Carolinian photography of the changing leaves. And I asked to be a member of the Outdoor Blogger Summit, thanks Ralph.